I am not a citizen of Belgium; I carry a French passport. But I am a citizen of Brussels, the most international of European cities. This is first a matter of migration: Several waves of immigration during the 19th and 20th century—first from France, Italy, and Portugal, and then from Morocco, the Congo Republic, and Algeria—have shaped the population. It is secondly a matter of structure, since Brussels and the Capital Region stand apart by design from the other parts of Belgium, which is a federal constitutional monarchy. (Yes, Belgium is a federal constitutional monarchy). Finally, it is that Brussels is defined by its international aspirations. Educated and professional European people like me have come to study and live and work around the various European institutions based here. Europe may still be just an idea elsewhere, but it is a reality here—with the consulting firms, the NGOs, lobbyists, and those who work in branches of the European Union itself. Those who come here to network and pursue internships (as I did) were committed to the international idea of Europe, and wanted to make a life and career that was explicitly European. But European ideals and identity have long been under pressure. And to be in Brussels has started to mean feeling under attack—even before the terrorist attacks on the airport and the Metro last month. As the economic crisis and the European dogma of austerity kicked in at the end of the last decade, the Brussels’ vibe changed. Daily life here started to be punctuated by a sense of emergency, expressed through visible and endless European summits. Those summits also occasioned more protests in Brussels—protests against austerity, against the big proposed trade deal between Europe and the United States. Right here in Brussels you could see the gap between Europe and its citizens widening as the protests went on and on. I could feel the European Union coming apart here before it got noticed elsewhere. This unhappy reality has slowly crowded out the things I’ve loved about Brussels. This city had a special magic that came with being so international and yet so small, at human-scale. It’s hard to feel lost in Brussels—the buildings are not so tall, the distances not so far. It was a nice little melting pot of people from very different places living closely together. I first felt in love with the place when I was a child and came here every summer to visit some of my parents’ friends. My memories of those times are full of comics like Tintin or the cowboy Lucky Luke. I remember the only statue that does not seem boring to kids: the Manneken Pis´–and the flower carpets that are created on the Grand Place in august. Later, when I returned to Brussels as a young adult student, my appreciation deepened. I discovered the numerous festivals, exhibitions, bars, concerts, cultural events, and beers of Brussels. I loved the place’s multiculturalism—go to a bar and you will hear at least 10 different languages being spoken. No one is a stranger in Brussels because everybody is! The hardest kind of person to meet here is someone from Brussels (or a Brusseleir). The recession and austerity didn’t end that, but it diminished the space and time for exchange. Then the menace and danger arrived last year. The first tension arrived with news of the attack on Charlie Hebdo magazine in Paris, on January 7, 2015. Ever since then, military personnel have been deployed in front of the European Institution buildings. 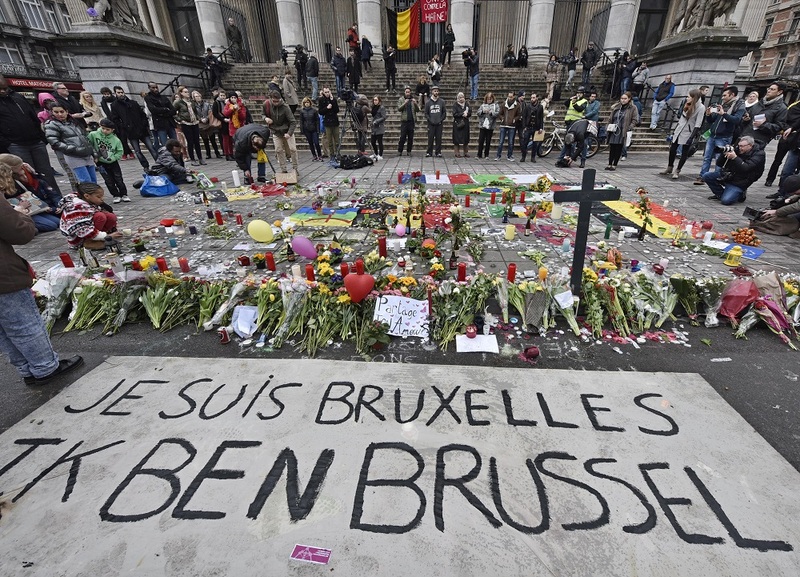 A deeper feeling of insecurity in Brussels started with the attacks last November in Paris. The alert level was then raised to the maximum (level 4) and military people started filling Brussels’ roads and squares. For the first time in my life, I saw tanks and military personnel in my city. For the first few days after the Paris attacks, Brussels turned into a ghost town—a city I didn’t recognize. The bars, the restaurants and the theaters where deserted. Daily life started to change in little ways. People started to go to work by car rather than taking public transportation. Patrols by the police became so frequent that they were seen as reassuring, and eventually normal. Every two days we could hear new police raids in Brussels’ neighborhoods. Our lives seemed newly connected to the news, the latest information about the potential French and Belgium cells working with ISIS. The conversation was strange. There was an overload of information about threats, and Brussels seemed somehow less European. We spoke more of the impact of violence and danger on our lifestyle, and less about the fact that the perpetrators had come from here, from our international city. Indeed, the authors of the attacks were almost always presented as strangers and not as children of our European society. They were described as marginal people and we did not try to understand their actions. The Brussels I loved had seemed so committed to understanding different people, of different backgrounds and languages! I found myself wishing for more conversation. I thought we should ask ourselves about the lack of hope in the European future and the growing dissatisfaction with European politicians. I wanted to know how people and civil society could play a role in defining our common future. How could young Europeans leave behind everything they have here, in the capital of Europe, and adopt an ISIS message, rather than building their own future with us? All of the changes last year established a feeling of being under threat. There was a collective sense that something bad was going to happen. When the terrorist attacks came, they were not unexpected. Those attacks came at places that helped make Brussels the international city with which I fell in love—the airport and in the metro station Maelbeek, near the European Commission and Council. I felt clueless and woozy on March 22 as I passed in front of the European parliament. I asked myself, Does any of this make any sense? I found myself remembering a slogan that was chanted at a lot of protests in recent years: “Your wars, our dead.” But whose wars are we living through nowadays and for what purpose? In the days since, I’ve had the unpleasant sense of being accustomed to this new way of life here, to the military uniforms and tanks on the streets, to attacks, to the dead, to the new Brussels. After the Paris attacks, President Obama said that French youth would have to deal with a new reality of terrorism that American young people learned some years ago. I hope this is not true. I want Brussels to rediscover its joy and gentleness. I want to live together here with my fellow strangers. The more different, the better! Julia Manuel is a French citizen born in Greece. She left Athens after her bachelor’s degree to study political science and European affairs in France and England, before moving to Brussels. Previously a writer for Cafébabel, she now works for the European Union administration. *Photo by Martin Meissner/AP Photo.